We have to make a few changes before moving in by adding a couple of walls and adjusting the washroom to include a bathing area. 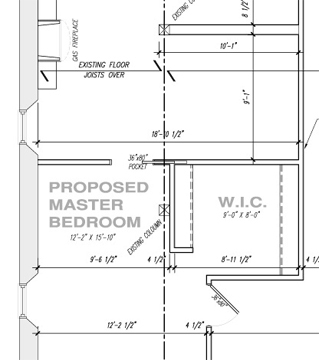 Professional drawings (floor plans and exterior elevations) are needed in order for us to apply for a building permit. This is one of those areas where I have learned so much about building codes, regulations, standards etc. When nothing is changed structurally (support walls) the drawings can be fairly simple. For areas where there are changes to support walls, footings, floor joists, framing, insulation and other structural changes, detailed lists must be included. First I drew up test drawings of where the walls would go and what our needs are. This is a surprisingly difficult task when you have a big open space and want to add walls. What are our needs now? Will they change in 10 years? Now would ideally be the time to plan for that. You need to decide what the paths will be that you take and where you go most often. What are the heavily used rooms and have the heaviest foot traffic? You have no idea how many times the walls moved by a foot and then back. This is the time to decide what can be done now and what you hope to add – leaving room for those things. This is the time for visualization (I liked that part). I also cut out scaled graphics of my current furniture to see if it would fit and if it allowed enough space for adjustments in the size of future furniture. Some of the other things that are considered at this time are sizes of closets, width and types of doors, type of lighting, positions of lights and plugs/switches. I started thinking about paint colours a bit too since thinking about the way the light would come in and the complete feel of the space was important to the visualization. 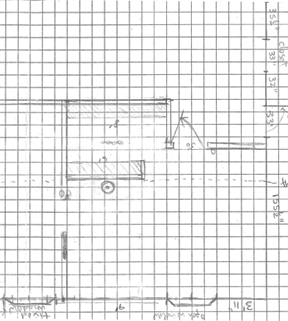 We hired a draftsman who went in and did detailed measurements with an electronic measuring device. It looked a bit easier than the two person measuring a 16 foot wall system. Here is a sample of the drawings we got back. Very nice. The drawings will then go to the contractor for pricing, materials and to apply for the building permit.